Women’s World Wow! | Paul's Voyage of Discovery & Etc. Did you see that game? Can you believe what you witnessed? The Women’s World Cup quarterfinal match between the United States and Brazil was one of those incredible, triumphant and uplifting moments that only sports can deliver. If you got up on Sunday morning to watch the game – and hung on through regulation time, stoppage time, overtime, and overtime stoppage time – you saw one of the most dramatic sporting events ever played. The U.S, scored in the first two minutes on an own-goal – which meant a Brazilian defender knocked the ball into her own net. Then, in the second half, the referees tried their best to hand the game to Brazil. A questionable red card dealt to a U.S. defender meant that the Americans had to play a man down for the rest of the match. Worse, that horrible call in the box led to a penalty kick for Brazil. American goalie Hope Solo made a brilliant stop on the ensuing penalty kick – but the referee mysteriously ruled that there was a foul on the play! (We still don’t know why.) Brazil got a second chance at the penalty kick and evened the score 1-1. Later, Brazil’s star forward, Marta, scored a go-ahead goal. Then, Brazil started flopping and feigning injury – and all the lame stalling tactics that demean the great game of soccer in the eyes of true soccer fans. It looked like the Americans were doomed. But the U.S. team did not quit. 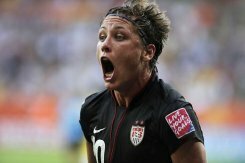 With scant seconds left in stoppage time of the second overtime — American forward Abby Wambach headed in the tying goal. Minutes later, the game was decided by penalty kicks. Actually, the game was decided by a penalty kick save. 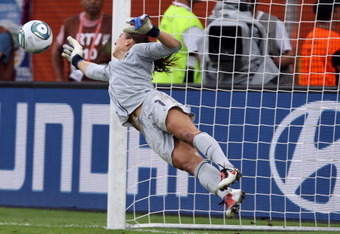 U.S. goalie Hope Solo stopped one of Brazil’s shots – and her dramatic save was the margin of victory. Congratulations to the never-say-die U.S. Women’s Soccer team. What an amazing sports moment! On to the World Cup Semifinal – and to the Championship! Great story. If you run out of work to do, or get bored with your current work, you could hire on at Sports Illustrated or some similar place.